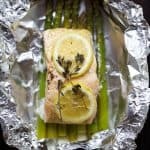 Citrus Asparagus & Salmon in Foil – so easy to make, loaded with roasted garlic and citrus flavor, plus clean up is a breeze! Dinner has never been easier! Create a pocket with 4 sheets of tin foil. Place on a baking sheet. Evenly distribute asparagus spears among the 4 pockets. Season with salt & pepper. Place salmon on top of the asparagus. In a small bowl, add mustard, lemon juice, and roasted garlic olive oil. Whisk together. Pour mixture over each salmon and gently rub in. Next place two slices of lemon and 2 sprigs of thyme on each salmon. Close the foil pocket up.